At Frontier we know all about camp being instrumental in changing the life of a kid. In fact, it’s one of our very core beliefs. Camp changes young lives. But that’s not where it ends. We also believe that when you change the life of a child, you affect the entire family. For many families, Frontier Camp is the common thread that runs through each child, connecting them in a very unique and special way. Sometimes, camp is the one constant in a day and age of inconsistency and shifting cultural values. Frontier Camp provides an anchor that parents can count on. Families discover Frontier in many different ways. Some are introduced to camp by friends, some hear a Frontier Camp presentation at their church, some find Frontier in a Google search. But occasionally, there are those who follow bread crumbs on the trail left by God Himself. On a lazy afternoon at the lake at a family reunion, Ed Butler discovered Frontier Camp. From there he was compelled to make it a traditional part of growing up for his three children. The Butler family was attending a family reunion at a lake cabin on Houston County Lake when Ed noticed several ski boats pulling skiers going right by the cabin. These weren’t just run-of-the-mill fishing boats pulling skiers. Ed was an accomplished water skier himself and he knew that these were high-end, pro ski boats. He couldn’t help but ask himself where they were coming from. Ed decided to find out. He blew up an air mattress and set off on a voyage of discovery. He was able to follow the boats back to their home cove and discovered a water playground crawling with young people. It was Frontier Camp. Ed knew then that this was a place he wanted to send his kids as soon as they were old enough. Ed and his wife, Cheryl, were both water skiers and they made sure their kids could ski almost as soon as they could walk. A camp with an emphasis on water skiing seemed like a perfect fit. Ed knew how to get to camp by water…now he just had to figure out how get to camp by land. At the time, Ed and Cheryl were living in Houston but Ed was working out of the east Texas town of Palestine. He took the occasion of being out and about on business to take a little time to look for the camp he’d only seen from the lake. Up and down county roads, mostly dirt roads in those days, through the Piney Woods, getting lost, then finding his way again. It took a while but he finally came to the Frontier front gate and drove up the drive. He had barely gotten out of his car when Wes Woodard came up and introduced himself. Wes was warm and friendly, plus he was a fellow Aggie, which didn’t hurt. Ed knew immediately that this was the place. After getting the nickel tour from Wes, Ed was ready to sign up his oldest daughter, Lauren, who had just turned eight years old. But like many other areas of their married life, Ed knew it wasn’t a done deal until Cheryl had the chance to check the place out in her own way. In the days before a simple Google search, Cheryl relied on her friendship network to find out more about Frontier. She was able to track down several other moms who sent their own kids to Frontier. They all eagerly endorsed the camp! Cheryl was a camp kid herself, having grown up going to a small church camp in Kerrville. She always knew she wanted her children to go to camp. She agreed with Ed, Frontier seemed to be the right fit. That year, Frontier had a bus that Houston-area kids could ride to camp. Ed and Cheryl took Lauren to the Northwest Mall where they met the yellow bus in the parking lot. They watched as their oldest loaded up for her very first camp experience. Lauren remembers that bus ride. She said good-bye to her parents in the mall parking lot and boarded the bus to camp, all alone without any friends. But the bus ride proved to be fertile soil for friend-making and she quickly made friends before the bus even arrived at camp. Lauren also remembers that her first counselors were sisters, Maggie and Melissa. Maggie is now married to the Frontier director, Matt Raines. Because Lauren’s dad had already taught her to ski, Lauren won the “Littlest Water Skier” award that very first week. Today, Cheryl can see that Frontier Camp really came into their lives at a great time. Camp was very influential in the lives of their kids from the start. She can see that they came away from camp every summer with a mind for ministry. It wasn’t necessarily full time ministry as a vocation, but rather a mindset that she knew they would carry throughout their daily lives. Lauren agrees. As an adult, she has taught children’s Sunday school and led an AWANA group as a way to continue ministering to children. From her experiences at Frontier, she learned how important it is for young children to establish a foundation of faith. She loves building relationships with kids as they travel along that journey. One of her favorite things to do was serving dinner at the Union Gospel Mission when she lived in Dallas. She loved being in the kitchen because it reminded her of all those years working in the kitchen at camp. To this day, Cheryl believes that Frontier was one of the things they did right as parents. With so much uncertainty in this world, there were still things that they could count on and Frontier became one of those things for their family. Once Lauren’s younger sister, Jennifer, started going to camp, Ed used the occasion to work in a little adventure with his youngest child, Ben. They’d load up to take the girls to camp (no more yellow bus!) and then use the father/son time together to do something fun. They found out that they could swim in the lake while the campers were taking their swim tests. They’d have fun swimming and hanging around the horses. Needless to say, Ben was ready when it came time for his first year at camp. Ed loved all the activities his kids got to participate in. So much so, in fact, that he was practically the very first to register when Frontier advertised their first family camp. He was tired of just hearing about the great activities on the way home from picking up the kids from camp. He wanted to actually do them! At that first family camp, Ed, Cheryl and the kids did everything there was to do. Ed was so exhausted at the end of the 3-day weekend he had to ask Cheryl to drive home. Now he knew why his children were always so worn out after their own week of camp. But camp is about more than just fun activities. It’s about the solid Bible teaching. Ed and Cheryl have been blessed by the spiritual influence their kids have gotten through the group and cabin activities with their counselors through the years. They always knew that at Frontier their children would be bathed in the Word all day long. It’s fulfilling as a parent to realize that your children are learning from so many other sources than just you, their parents. It’s such a great feeling to know that sending your kids to an influential camp was a wise move. Even though Ed and Cheryl were sending them because of the water sports and other activities, they knew there was something else going on, something much deeper and more meaningful. The kids were learning the Bible; whether it was in devotion time with the whole group or cabin time with the counselors. A great by-product of this discipleship was the lifelong friends they’ve made. 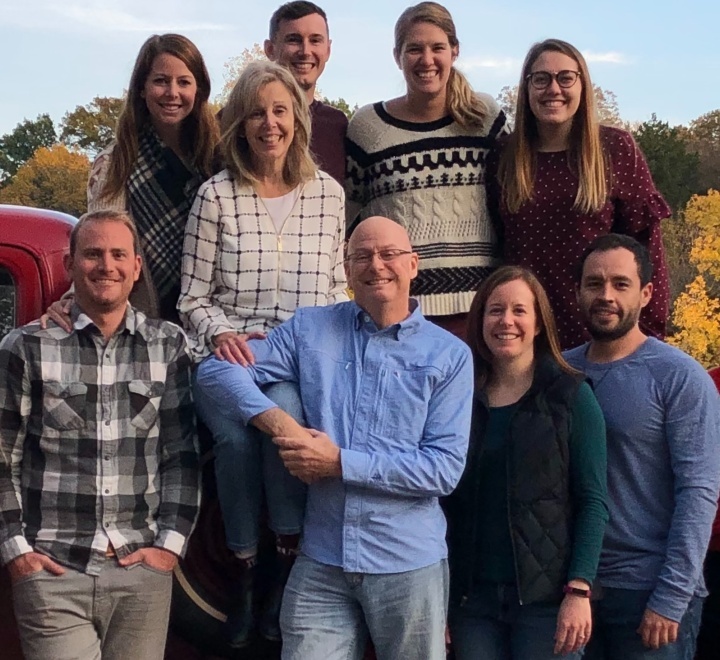 Each of the Butler kids has gleaned as much or more through their experiences of being on staff over the years as they did when they were campers. Ed remembers speaking with a friend whose son was a friend of Ben’s. Both boys were in college by then and during the summer they both had jobs. Ben was working as the program director at Frontier, while the other boy was working in a lab. Ed thought about the two boys and the summer jobs they had chosen. The job in the lab no doubt paid more and possibly even held a bit more prestige, especially in the business world. However, Ed was confident that Ben actually had the better job. Ed knew that his son would learn much more about working with different kinds of people and complex problem solving in real world situations. Ed knew that the job at Frontier would prove to be a more valuable experience in the long run. With Ed in the oil business, the family moved frequently during the kids’ growing up years. But today Ed and Cheryl can both see that throughout all those changing towns, schools, churches and neighborhoods, Frontier was one constant that the family could count on. Ed and Cheryl believe that Frontier accomplishes a lot that the parents and even the kids aren’t even aware of until years later. Yes, kids can go to church camp with all their friends but in that case they are fully insulated in their friendship comfort zones. When they go to a camp like Frontier, even if they go with a friend, the experiences they encounter will pack a punch, teaching lessons that last a lifetime. It’s hard to quantify the impact of a Frontier Camp experience on a family. Learning new skills, forging friendships that last a lifetime and discovering a deeper, more meaningful walk with Christ are all certainly high on the list. But sometimes the real value of camp isn’t discovered until many years later when kids have become grown adults. Today, Ed knows that one of the best things he ever did for his family was to take a voyage of discovery on a blowup air mattress.